I have been struggling on how to introduce this new idea to the blog for several months now. I truly enjoy bringing my most recent experiences in my hunting life to the electronic world of A Colorado Hunter's Life, but I feel I am dismissing the lessons that brought me to this point in the first place. As the summer months progress I plan on taking you along with me on the preparations and the actual adventure of the Alaskan Caribou hunt. However, until then I also recognize the need for variety and depth of different topics. With that in mind I will introduce you to the first of what I hope to be many posts about past tales of hunting successes, failures, and hopefully some humorous situations along the way. There are two shoulder mount elk heads that adorn the front entry way of my home. These are placed there much to the dismay of my wife, she has even recently taken to the idea of writing a counter blog title, "A Colorado Hunters Wife." Despite her protests about the heads, she and my daughter have named the two bulls, Burt and Elmer. Do not ask me what the origin of the names is, I have a theory it is some take on Burt and Ernie that came from the mind of a 4 year old little girl. This story is about Burt and how he came to be up on my wall. It was archery season 2011 in Colorado and despite nearly a week sitting my tree stand I had yet to even set eyes upon an elk. It seemed that everywhere I went the elk where not. My hunting partners had reported many sightings and a few arrows had even taken flight but had missed their mark. I had already filled my mule deer tag with a small 3x3 buck and was enjoying purely pursuing elk. I hunt elk a bit differently than most archers. While I will not tell it is the only way, it has worked repeatedly for me and consistently put me within bow range of the animals. 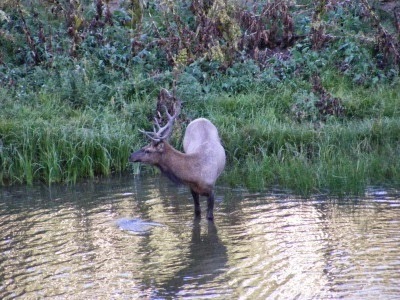 While some archers prefer to try to call the elk in, or attempt to spot and stalk them, I tree stand hunt elk over watering holes and wallows. The scouting time required can be enormous but once you know an area the payoff can be awesome. In the last five years I have taken four bulls with my bow, and the odd year out was because I failed to draw my elk tag. The technique is simple, find water/wallows with a tremendous amount of elk sign, set your tree stand/blind, and wait. It is the waiting part that is frustrating for some hunters. Sitting in the same place for up to eight hours each day can be draining for sure. For me there is solace of letting the woods return to their natural state and forget that I am there. Burt and I met on Thursday, September 1st, 2011. It was a beautiful fall evening, and I was stationed 25 feet up an aspen tree overlooking a large watering hole. Many elk have fallen to our clan's arrows and muzzle loaders on this particular spot over the years. This year the action had been slow. It was the magic hour before sunset when the whole forest comes to life with pre-darkness activity. I heard the lone bugle about 200 yards down the drainage that was fed from the watering hole. It was not a full challenge bugle, but a tending bugle; a bull moving his harem of cows. I knew instantly it was a real elk and not a misguided hunter. I decided to respond with a simple cow call in the hopes the bull was in the market more female company. Immediately after I made the call he answered back, this time it was a full bugle and it was impressive. The forest instantly was filled with the sound of an elk herd moving. Now elk can be pure ghosts seeming to materialize out of thin air in front of you, or they can be incredibly noisy. This heard sounded like a freight train was coming towards me, and fast. It was clear the bull was pushing the cows up the drainage. The bull gave me another bugle and this time it sounded much closer, he was coming and coming in a hurry. 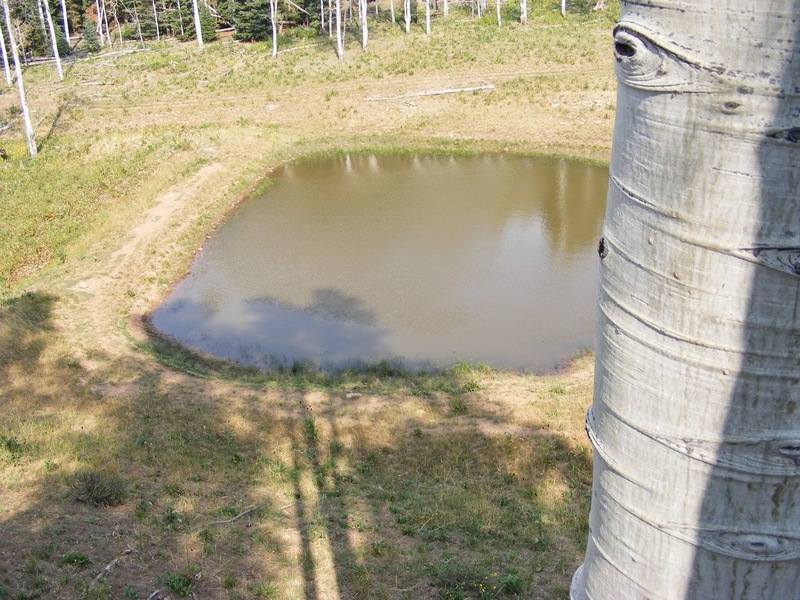 Pond and view from tree stand. I quickly grabbed my bow off the hanger stood up from the seat and notched the release onto the string loop of the Matthews Outback compound bow. That was all the time I had before the bull appeared. He was what we call a rag horn, barley passing the 4 point minimal legal requirement. He was at the head of the column of cows and when he stopped broadside at thirty yards I resisted the temptation to send the fletched shaft into the side of him. I knew from experience that the herd bull will often push the cows and I did not think this was the bull I had heard. The herd slowly filed past me and walked to the pond for a drink. As each cow walked by, my level of anticipation increased, had I made the right call? was there another bull? Then I saw him. There was no need to count points and no wondering if he was a legal, he was a monster. I could see his antlers towering above the scrub bushes, and his body was twice the size of the largest cow in sight. 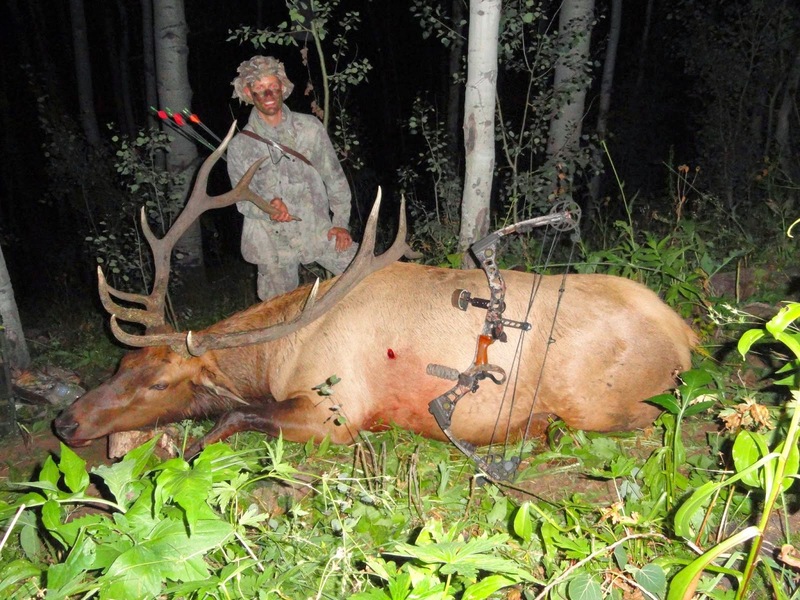 This was the biggest bull elk I had ever seen in a hunting situation. I knew I had to forget about the antlers, if I focused on them I would blow the shot for sure. I instead merely looked for the biggest elk in the herd as that could only be him. He walked passed me at 25 yards, but did not pause for a shot. He then walked out to the pond and stood directly over the rock I had positioned at 35 yards. There it was, my shot. Recognizing and waiting for the perfect shot is hard thing to do for some archers, and I have both waited to long or shot too early. This was it and I knew it. I picked a spot on the vitals of the bull, pulled the bow to my anchor point and settled the sights with the 30 yard pin slightly above the center line. I fought the urge to stab the release trigger and let the arrow fly. I instead worked through my release sequence, squeezing the trigger and waiting for the surprise shot. The bull moved before the bow went off and with luck I stopped the shot before it was too late. He entered the large pond and walked out to he middle of it to take drink. I knew the middle of the pond was 50 yards, this is the maximum range I will shoot at an animal with my compound bow. Too much can happen in the flight time at ranges past this point. The water line was just below center of the bull and I knew I still had a shot. Less than optimal, but I felt if I did not take it, I could lose this bull forever, plus I was still at full draw. I once again picked my spot and aligned the pins on the vitals. The twang of the string surprised me, I can still see the arrow in flight. The green plastic nock caught the evening light of the sun and glowed with green fire. Everything was in slow motion and the arrow seemed to take an eternity to reach the target. What was perhaps measured in milliseconds seemed to be hours to my hunter brain. As the range was great the arrow arched high and then fell towards the bull, I feared I had missed, until I heard the telltale thwack of the arrow striking the animal. I did not see the hit, but he reacted instantly, trudging through the water towards the distant shore of the pond. I immediately gave the bull a cow call, while reaching for a second arrow. The bull ran back towards the draining he came from and paused in front of me at a mere 30 yards. I began to draw the bow but stopped. There was a bright red spot rapidly growing in size on the opposite side I hit him on, the arrow had passed through. The exit hole was in the perfect place for a lung hit, there was no use spooking the bull any further, he was going to go down and soon. I focused on calming him rather than sending another broad head into him. I continued to cow call as he angled up and away from me on the hillside bordering the drainage. He paused once again before I lost sight of him and I mentally marked where I had lost sight of him. The cow calling worked on the herd, while they had spooked at the shot, they now regrouped in front of me. The little bull even walked towards my tree stand trying in vain to figure out how a cow elk had climbed up a tree. Meanwhile I could hear my bull cough from the side of the hill on the drainage, he was not too far away and more than likely down. 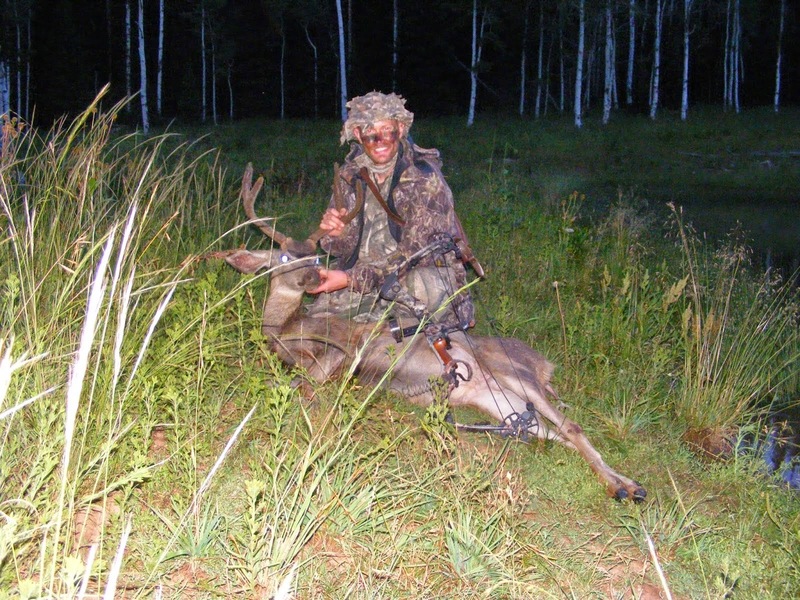 Any seasoned hunter can tell you about the rush that accompanies a successful shot. For archers the rush is extreme. I have nearly walked right off a tree stand into space after a shot as I was so amped up. Whole body tremors, loss of dexterity, and uncontrollable shaking is common place. Learning to manage this until after the shot is the mark of a veteran. I had the shakes bad after this shot. Even if I wanted to climb down and look for the bull, I physically could not. Twenty minutes later found me better collected, and following an archery hunting commandment of giving the animal time to expire. There was not much blood to follow. It surprised me as I had seen a clean hit. I went to where I had last seen the bull and in the fading light saw a shape and color ahead of me that could be a down elk. As I approached the shape it grew into the beautiful 6x6 bull that I thought it was. He was down and expired. I sat on a log opposite the elk and had a moment of silence with the animal I had just killed. It is moment true hunters know. An honoring of the sacrifice the animal made, and the bond that predator and prey share. People like to forget what we really are; predators, ones with the unique skill of being able to kill at a distance. The remainder of the evening saw the elk, which was as big as a small horse, carried out in pieces on the backs of my fellows hunters and I to the nearest vehicle trail. Months later I had the bull measured by the Pope and Young Club. His gross score was just shy of 300, but dipped to 280 4/8s after deductions. While he was entered into the P&Y big game records, I do not hunt for this. I hunt for that moment. The moment where I know what it is like to be an animal and truly human. I would be lying if I did not add that I hunt for food, game meat is big part of my life and I would greatly miss it. Closing thoughts this time are from David Frost. As this tale is about a successful hunt I feel it is only appropriate. Don't aim for success if you want it; just do what you love and believe in, and it will come naturally. - David Frost.